WASHINGTON, DC - JANUARY 21: Rev. Al Sharpton speaks during the National Action Network Breakfast on January 21, 2019 in Washington, DC. Martin Luther King III was among the attendees. If you’re a black candidate running for public office, your theme song can literally be, “And I’m black, y’all! And I’m blackity black and I’m black, y’all!” and still win because being a black and proud politician is now in, a marked shift in a country that for so long forced many black politicians to deny or downplay their race. That change was obvious during the 2018 midterms when we saw Stacey Abrams shouting out Spelman College and greeting white folks around Georgia with natural hair and all. We saw it in Florida with Andrew Gillum walking out to stump speeches as “Walk It, Talk It” blared over the sound system. Last year’s midterms saw record-breaking numbers of black women winning congressional seats and leaning into their blackness in the process. The change has been so acute that in 2019, it might be taken as a negative if a black person appears to run away from her blackness to appease white folks. Citing his 2004 run for president, Rev. Al Sharpton isn’t shy about giving himself some of the credit for all this open blackity political blackness. A truer marker of his influence is the trek top Democratic presidential candidates routinely make to New York to get his blessing. During his presidential run 15 years ago, Sharpton rejected advice from friends and associates to tone down his personality—even refusing to get rid of his James Brown-inspired perm. People told him to suspend his activism to appear more presidential. He ignored them and kept leading marches in between campaign stops. That’s why he believes his political bravado helped pave the way for the freeness many black politicians seem to have today. 2020 Democratic presidential candidate Sen. Kamala Harris (D-CA) and Rev. Al Sharpton exit after having lunch at Sylvia’s Restaurant in Harlem, February 21, 2019 in New York City. Whether you chop up his observations as pure self-aggrandizing or legitimate, it is clear he’s built himself into arguably the most influential civil rights activist in the country—one that presidential candidates must hold court with to help gauge how viable their campaigns are with black voters. Next Wednesday, most of the Democratic presidential candidates will appear at Sharpton’s National Action Network Conference over a three-day period (April 3-6) to speak with black activists and attendees about how their policy proposals will improve the prospects of black America. What makes this year’s conference, which Sharpton claims is the biggest civil rights conference in the nation, unique is that black people will have little patience for candidates who run away from discussing black issues for the sake of appeasing white audiences. Abrams, who barely lost a Georgia gubernatorial race last year that included allegations of rampant election irregularities, will open up the conference. Over the course of two years, Abrams ran on an unabashed blackness that refused to code switch. She is scheduled to make a decision about her near-future political plans in April. Others expected to attend NAN include Senators Elizabeth Warren, Cory Booker, Kamala Harris, Bernie Sanders, Kirsten Gillibrand, and former Congressman Beto O’Rourke. Given that at least 10 candidates are likely to appear over the three-day conference, those who want to stand out will have to really speak to the radical political needs black people have long called for. For example, Sharpton would like to see candidates call for a federalization of police and more clarity on how the candidates would pave a way for reparations to be paid to black Americans. NAN will also serve as a space for some of the candidates to address misconceptions about who they are as people, not just as politicians. Sharpton said some of the concerns he has heard about Harris and Booker, for example, are that they come across as inauthentic. He hopes they will address those concerns next week. His advice for Sanders? Tell us what you’ve done for black folks besides march with MLK. Sharpton has made that clear with Sanders each time they’ve met. Democratic presidential candidate Sen. Bernie Sanders speaks beside Rev. 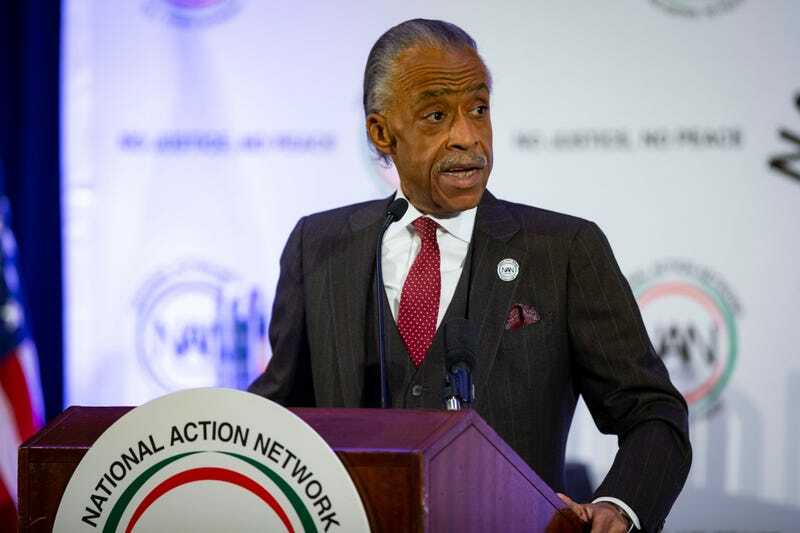 Al Sharpton during the 25th annual National Action Network convention on April 14, 2016 in New York City. Sharpton’s National Action Network, founded in 1991, has more than 100 offices around the country, with 54 full-time staff in the New York City headquarters alone. It has functioned as something of a rapid response unit for black trauma, responding to some of America’s most violent acts of police violence against black people. What makes Sharpton a respected figure has as much to do with his personality as it does with the organization he built to outlive him. Flash-in-the-pan activists come and go as soon as their personalities fade. Camonghne Felix, a political consultant who has served as a senior advisor on local and national campaigns, said Sharpton has shown the ability to not fade into irrelevance. Sharpton is in his eighth season hosting MSNBC’s Politics Nation weekly, which has received mixed reviews. One of the strongest critiques early on was that he read from the teleprompter like a elementary school kid who was just learning how to read. That’s why MSNBC executives told him to work without one— and they instantly saw an improvement in his delivery. Rev. Al Sharpton (2L) speaks to Stevante Clark (arm raised) during the funeral services for police shooting victim Stephon Clark at Bayside Of South Sacramento Church March 29, 2018 in Sacramento, California. Moshe Arenstein, executive producer for MSNBC’s PoliticsNation, told The Root that Sharpton is an excellent listener and masterful speaker, adding that his civil rights background make him a natural fit for the network. “Sometimes less structured conversation allows those attributes to really shine through,” Arenstein added. He’s been without the teleprompter for the past four years. Most days have Sharpton waking up at 4 a.m. to workout so he can focus on his gym routine and avoid folks who want to interrupt him for selfie requests. He considers it his own form of therapy to deal with the trauma of consoling families who’ve lost their loved ones to police brutality. He has never seen a therapist to help him deal with the black pain he takes on daily. He tries to stay healthy in other ways too. Chicken and meat aren’t in his diet, and he only eats one meal a day—a salad. Fish is his only protein, which he eats every Saturday. MCALLEN, TX - JUNE 21: The Rev. Al Sharpton joins other members of an interfaith delegation of 40 religious leaders as they hold a news conference before visiting the U.S. Customs and Border Protection’s Centralized Processing Center on June 21, 2018 in McAllen, Texas. The group had demanded that the Trump administration immediately end the policy of separating families seeking asylum at the nation’s borders. His only “bad habit” is cigars, which he smokes often. Sometimes, he sees Trump’s sons at his favorite cigar spot. Last year, he announced that he was raising money for an African American museum that highlights the Civil Rights Movement in the North, which will be located in Harlem, on 145th and Lexington. More than $40 million is needed to fund the project. So far, $5 million has been raised. Sharpton hopes ground will be broken a year from now and the museum completed two years later. Even if you don’t like Sharpton, you have to respect him and the influence he wields. It used to hurt him when people accused him of being a shyster or a crook, or that he only cared for black people just to be able to stand in front of a camera. Now, he’s at peace with it all and ignores the noise.